Will SF Supervisors make sleeping in San Francisco parks a crime? "We need more services; not more citations." Rally opposing Scott Wiener's bill held October 29th at San Francisco City Hall. 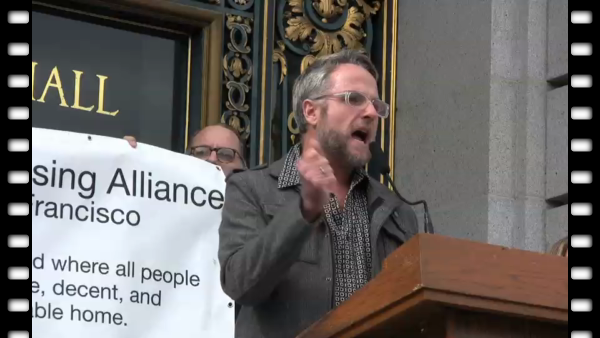 With almost 30% of San Francisco’s homeless population identifying as LGBT, and many living on our streets and in our parks, we know who the real targets of this legislation are. This is yet another attack on the homeless, on queer people, poor people, and people of color, and on our right to exist in public space in our society. The Harvey Milk Club has had enough. Parks are for people and we believe this policy to be another step in the wrong direction for San Francisco. §"We need more services; not more citations."